There’s no question about the benefits of integrating your Helpdesk system with Nicereply, and that’s why we’re continuing our series of successful integrations, this time with a great tool called Mojo Helpdesk. Let’s dive into the integration example. Let’s say we run a company that cares about their customers, uses Mojo Helpdesk and wants to use Nicereply to get customer feedback on its agents’ emails. First we have to edit the user IDs of our agents to match those of Mojo Helpdesk. The user ID can be easily found by visiting the settings of your particular agent ( Staff > click “edit” by the user ). The ID is the last part of that page’s URL. Enter this number to field ‘Username’ at Nicereply profile in Settings -> Edit Person. We repeat this with Betty Kitty. Now for the Mojo Helpdesk part. We’ll set up our rating link by editing the Email Template ( manage > Configure emails ). The email templates are set up at the bottom of the page. Let’s say that we want the customer to be able to rate our message every time we reply. 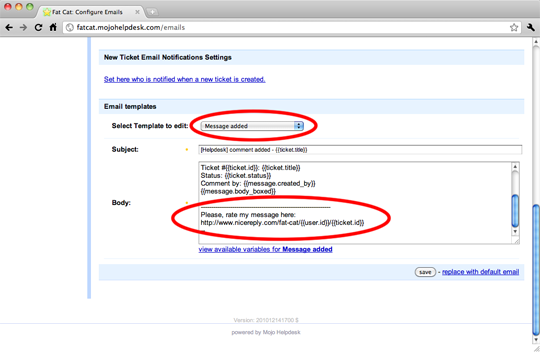 Let’s choose the default “Message added” template. We have now successfully connected Nicereply with Mojo Helpdesk. 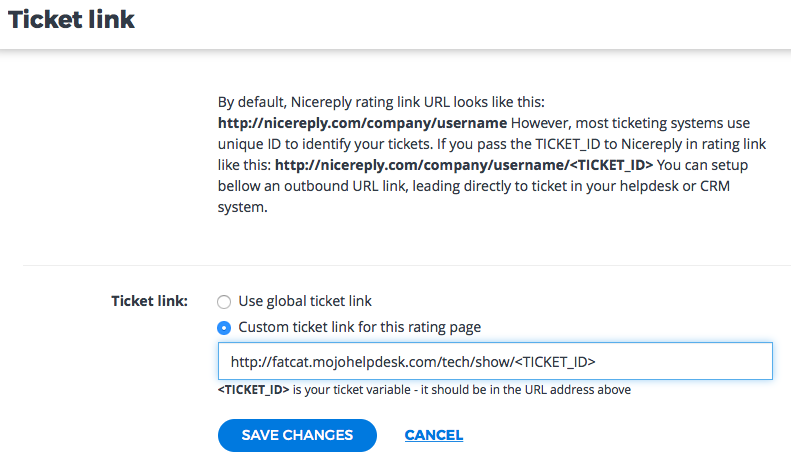 Your customers will now be able to rate your help desk emails and you’ll have the ability to easily evaluate the performance of your help desk team AND see what ticket every rating relates to.